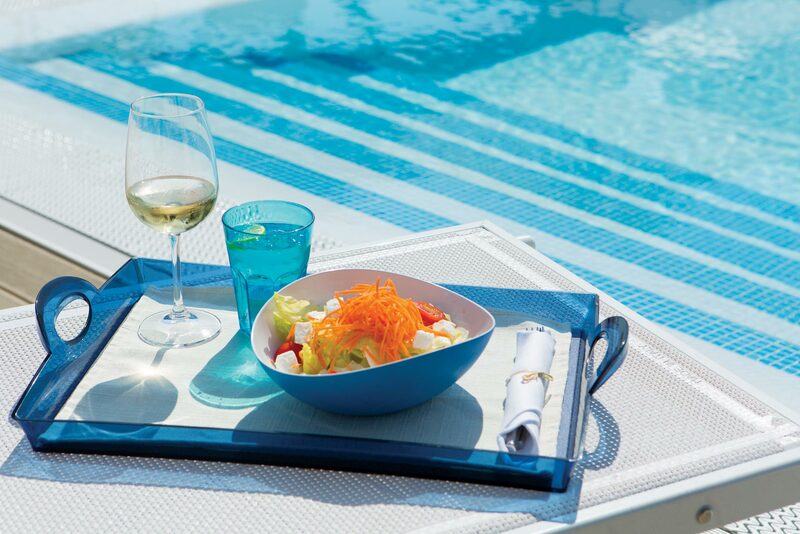 Smart, easy going, by the pool are the three key factors for a relaxing break by the pool. The LightBlue Bar is the quintessential summer spot, epitomized by the turquoise-colored swimming pool it overlooks. A casual yet elegant location where guests can enjoy the colors of the day and the magic of summer nights by the sea, thanks to a fast and attentive “all day service”. The meticulous attention to quality of raw materials and our bartenders’ comprehensive knowledge of drinks offer our guests a “Turquoise” experience. You can’t pass up the opportunity to sip an aperitif in pure Almar style, a fruity cocktail or a glass of wine accompanied by a light snack surrounded by a relaxed and sophisticated atmosphere. A break with traditional Italian flair, featuring seafood specialties, fresh salads, as well as a variety of ice cream flavors and homemade pastries. Sheltered from the sun under the large patio umbrellas in elegant hues of white, the terrace of the LightBlue bar is the ideal place to stop on the way back from the beach, after a relaxing morning swimming in the pool or shopping in the city center. Turquoise is the blend of two colors, a perfect harmony between the purifying effect of green and the relaxing and refreshing influence of blue. Harmony that can also be found in every single element of the Light Blue Bar. Turquoise is the color of the unconscious, and, most importantly, of the sea, of crystal-clear waters; it also evokes the color of the swimming pool the LightBlue Bar overlooks. Turquoise instills calm, dissolves tension, and is synonymous with freshness just like the selections from our menu.